Ok, they look more like pawns in a chess game, I know. But this is what I have! Nice and quick this time and am not that pleased with it, but I can move on!! The inspiring EDM (EveryDay Matters) group can be found here. 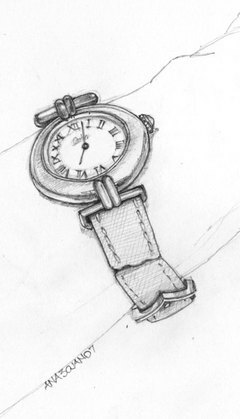 I felt a bit of a cheat yesterday, posting an incomplete and unfinished piece so I thought I'd do the challenge again, this time with a quick drawing of my watch. I bought this watch years ago and it's my favourite and has been completely refurbished once already, it's so old. Really tried to loosen up a bit on this sketch and not be tooooo perfectionist (hah!). sigh. Didn't really work, my hands just wouldn't allow me to alter my strokes so we had a bit of a struggle. Am not too sure of who won, but am happy with it nonetheless. 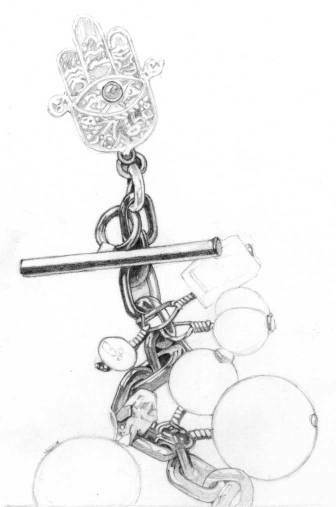 Hmmm, I've been asked to do another couple of pieces of jewelry by the same friend whose bracelets I did before, so I guess that would fit into EDM challenge #8: draw a watch or other piece of jewelry. Problem is, it's still a work in progress (ok, I didn't finish it yesterday!) and I haven't added any colour as yet, so I'm posting the unfinished piece and will post it again when it's all done, but this is it for the 29th January daily sketch! 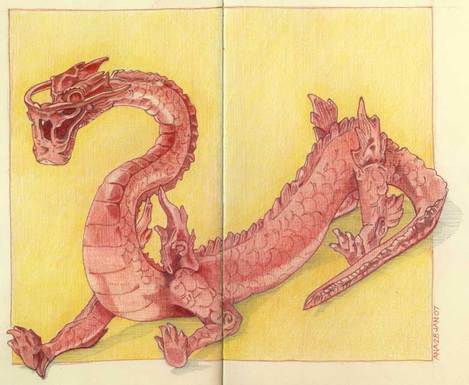 Bought this dragon at the Sunday Market today and it just cried out to be drawn up in red. So am putting it up for this week's Illustration Friday topic. 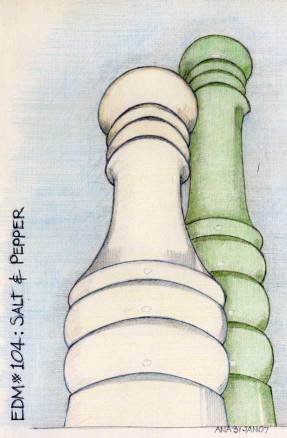 Colored pencil & graphite HB. Moleskine journal. Yes, this is it! 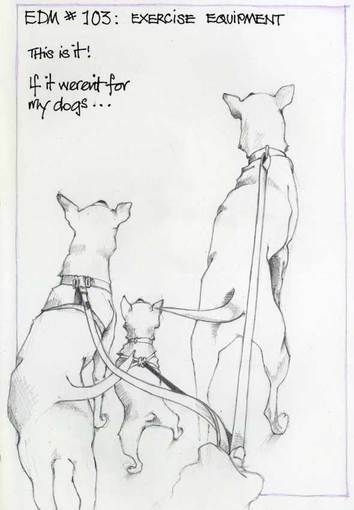 If it weren't for my dogs ... I'd be an unhealthy couch potato! They get me out walking and getting my daily intake of fresh air and sunshine. Loads of entertainment and play! From left to right: Bella, Scruffy, Bertha. I've been BUSY! Thus the quick sketch, hopefully just in time. Graphite HB & 2B (and a dash of purple colour pencil for the frame! ).